eESI’s Practical Tips For Managers Podcast Asks: Why is HR So Hard? - eEmployers Solutions, Inc.
eESI’s Practical Tips For Managers Podcast Asks: Why is HR So Hard? If you operate a small business you may already know the answer to the question, why is HR so hard? Each year, new federal, state and municipal laws are passed that affect how businesses large and small handle employment matters. From the moment you hire your first employee and even during the hiring process, various laws apply. Keeping track of it all can be a challenge. Helping business owners and their management teams face those HR challenges is the reason we created the eESI podcast series, Practical Tips for Managers. 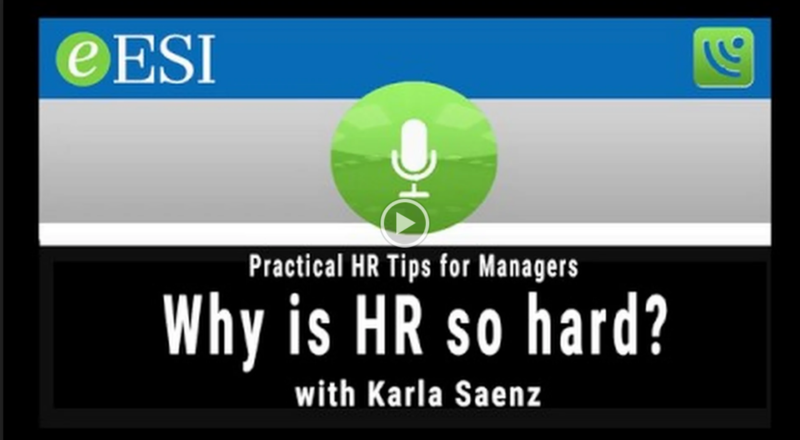 For Part 3 of this series, Why is HR so Hard?, we spoke to eESI HR business partner Karla Saenz about some of the laws and regulations your management team should know about in order to avoid making costly mistakes. Why is HR so hard? A lack of knowledge is part of the problem. During this podcast, Saenz tells us about what went wrong at the Katy-area Shipley’s Donuts franchise. In 2015 the business paid $45,000 to settle claims brought by the EEOC after an employer and manager asked too many questions about an employee’s rumored pregnancy, and later fired her. As Saenz explains, the employer may have felt that he had a right to know about the employee’s pregnancy and her ability to work safely, but he didn’t have the right to ask her. If he and his manager had better understood the anti-discrimination provisions of Title VII of the Civil Rights Act of 1964 and their obligations under the Pregnancy Discrimination Act, they could have saved themselves a lot of trouble and money. Saenz also discussed another recent EEOC settlement involving Title VII of the Civil Rights Act, this one involving Bass Pro Shops. After years of investigation and negotiation, the nationwide retailer agreed to pay $10.5 million in 2017 to resolve the EEOC’s outstanding claims against it regarding discrimination in hiring. What could Bass Pro have done to avoid this liability? In an interview with SHRM’s Lisa Nagele-Piazza, attorney Daniel Prywes said, “an ounce of prevention is worth a pound of cure.” Knowing the basics regarding hiring, selecting, and even placing ads for employment could have protected the company. Prywes also recommended that companies conduct regular equal employment opportunity (EEO) training as part of their standard HR best practices. Further, civil rights laws aren’t the only regulations managers need to understand, Saenz warns. The Fair Labor Standards Act (FSLA) applies to any business that has even one employee. The FSLA sets a national minimum wage, governs when overtime must be paid and regulates the employment of minors. In addition, managers and business owners should make sure they understand federal employee classification laws and ensure that their practices are in compliance. Correcting a misclassification error can be very expensive, as an employer may be liable for unpaid overtime, payroll taxes, and even fines after classification errors are corrected. And, as Gene Zanio explains in this article, When Misclassification Comes Your Way, Here’s What to Do, misclassifying your employees as independent contractors can lead to an outright IRS audit and heavy financial penalties. What does Saenz recommend employers do to keep HR from being so hard? First, she tells us, stay informed. Keep yourself updated on changes to the law. Next, provide your management team with regular training. Even if your staff understands the law, regular refresher courses should be a part of your HR management plan because employment law is constantly changing and updating. And, finally, when in doubt, ask for help. Call on eESI if you have a question or just want to make sure you are handling a situation correctly. HR can be hard if you try to go it alone, but we’re your HR business partner and we’re here to help. Call +1(210) 495-1171 to learn more.